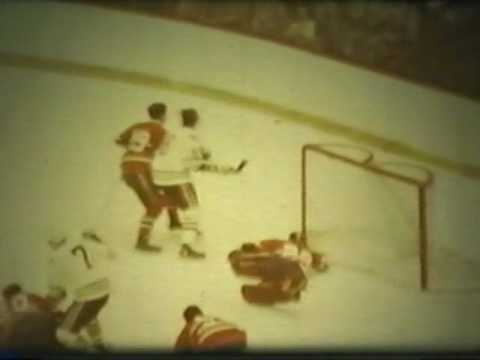 The 1971 Stanley Cup Final NHL championship series was contested by the Chicago Black Hawks and the Montreal Canadiens. The Black Hawks made their first appearance in the Final series since 1965, the Canadiens had last played and won the series in 1969. The Canadiens would win the series 4–3. The playoff system changed this year to allow cross-over between the divisions during the playoffs. Chicago defeated the Philadelphia Flyers 4–0 and the New York Rangers 4–3 to advance to the final. Montreal defeated the defending champion Boston Bruins 4–3 and the Minnesota North Stars 4–2. This set up the first "Original Six" finals since the 1967 Final. Brothers Frank and Peter Mahovlich starred for the Canadiens, scoring nine goals in the seven game final series. Ken Dryden debuted for the Canadiens, while this was Jean Beliveau's final finals appearance, and he ended his career with ten championships. This would be only the second time that the road team would win a game 7 in Finals history. The only previous time it happened was when the Toronto Maple Leafs defeated the Detroit Red Wings 2–1 in Game 7 in the 1945 Stanley Cup Finals in Detroit; it would not happen again until 2009, when the Pittsburgh Penguins defeated the Red Wings in Game 7 by the same 2–1 score. The next 7-game Stanley Cup Finals would not occur until the 1987 Stanley Cup Finals with the Edmonton Oilers and the Philadelphia Flyers. After missing the playoffs for the first time since 1948, the Montreal Canadiens entered the 1970-71 season on a mission. They did not disappoint. The Habs were able to defeat the Chicago Black Hawks in a thrilling seven-game final. Henri Richard was the hero of game seven, scoring two goals in Montreal's come-from-behind 3-2 win. Rookie netminder Ken Dryden stole the playoff limelight by posting a 3.00 goals-against average in 20 playoff games. Dryden was awarded the Conn Smythe Trophy in the process. Montreal collected their 16th Stanley Cup win, and said goodbye to captain Jean Beliveau, who retired at the conclusion of the season. In the quarterfinal against Boston, who finished 24 points ahead of the underdog Habs during the regular season, Montreal took the series to the limit before finally prevailing in seven games. An incredible comeback from a 5-1 deficit in a 7-5 win in Game 2 in Boston and victories in the final two games were the highlights as the Canadiens eliminated the NHL powerhouse from the postseason. The Canadiens and North Stars exchanged victories through the first five games of their semifinal before a Habs’ 3-2 win in game six broke the pattern and sent them through to the Finals against the Chicago Blackhawks. The first place finishers in the West, Chicago opened the Stanley Cup Finals at home with a 2-1 overtime win and followed it up with a second victory, taking the next game 5-3. Down two games and trailing 2-0 in the third game, Montreal’s four-goal outburst gave them a 4-2 victory as Yvan Cournoyer netted the game-winner. He potted two in a 5-2 win in game four, tying the series and sending it back to Chicago Stadium. Home teams continued to dominate, with Tony Esposito shutting out his former teammates 2-0 in the fifth match. Back in front of Forum fans, Montreal overcame a 3-2 third period deficit, with goals by the Mahovlich brothers tying the series for the second time. After allowing Chicago to take a 2-0 lead in front of their fans in the final game, goals by Jacques Lemaire and Henri Richard evened things up. Two and a half minutes into the third period, the “Pocket Rocket” gave the Habs a lead they held until the final siren. Jean Beliveau retired as a 10-time Stanley Cup Champion and Ken Dryden, between the pipes for every minute of Montreal’s postseason, was named the Conn Smythe trophy winner as postseason MVP. The 1970–71 NHL season was the 54th season of the National Hockey League. Fourteen teams each played 78 games (six games against each opponent). Two new teams, the Buffalo Sabres and Vancouver Canucks made their debuts and were both put into the East Division. The Chicago Black Hawks were moved to the West Division. Prior to the start of the season, the Oakland Seals were renamed California Golden Seals. The Montreal Canadiens won the Stanley Cup by beating the Black Hawks in seven games in the finals. From this season through the 2002–03 season, teams wore their white jerseys at home and their dark jerseys on the road. 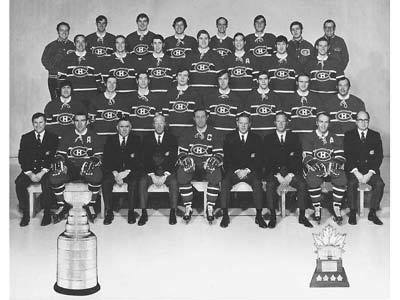 The 1971 Stanley Cup finals were played by the Montreal Canadiens and the Chicago Black Hawks. The series went the full seven games, with the Canadiens winning in Chicago despite trailing 2–0 halfway into the second period of game seven. Jacques Lemaire took a shot from centre ice that miraculously escaped goaltender Tony Esposito, cutting the Black Hawks' lead to 2–1. Henri Richard tied the game just before the end of the second period, and scored again 2:34 into the third, giving the Habs the lead. Montreal goalie Ken Dryden kept Chicago off the board for the rest of the game, and the Habs won their third Stanley Cup in four years. It was the final game for Canadien superstar and captain Jean Beliveau, who retired after the season. The Canadiens were the last road team to win a Game 7 of a Stanley Cup Final until the Pittsburgh Penguins in 2009. The only other team to do so were the 1945 Toronto Maple Leafs. It was Al MacNeil's final game as Montreal coach — after he had benched Richard for Game 5, The Pocket Rocket declared that "[MacNeil] is the worst coach I ever played for!" Although Richard retracted his "angry comment", as he called it, MacNeil still resigned.